RVM - The new season! Launch of my first tv web clip! Marie-Andrée Ostiguy & the Artémuse String Quartet : 4 concerts in Alberta! As part of the Rendez-Vous de la Francophonie, the Société Edmonton Chante is proud to present “Rêverie” by pianist/composer Marie-Andrée Ostiguy, accompanied by her musicians, the Artémuse String Quartet. 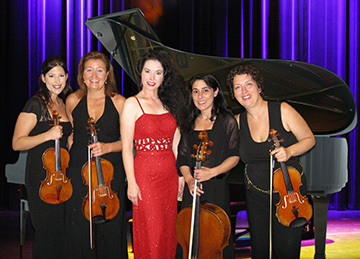 The Artémuse String Quartet is comprised of Solange Bouchard, first violin, Amélie Lamontagne, second violin, Christiane Lampron, viola and Elizabeth Dubé, cello. To learn more about this tour, download the official press release. two dollars will be donated to the Canadian Cancer Society.